Olympic Burger was a hole in wall, which was tucked away in a strip mall at the corner of Vermont and Olympic in K-town. The whole place was about as big as the average living room and probably sat about 12 people. We were the only patrons that were dining in--not a great sign. One of the draws of this place was its arcade video games and the fact that they served Orange Bang. Those are two things that we did not care about. We ordered a couple of single cheeseburgers (1/4 pound for $2.50 each) fries, and a couple of drinks. Fat Bruce Lee also ordered some chicken nuggets, because being fat does not happen by accident. We were all in for about 14 bucks. The Beef: It was hard to say. I'd guess that it was Chuck, but it was mighty bland--really nondescript. The beef wasn't bad, it was just not doing anything in the dish. It added zero flavor. It was, however, surprisingly tender. I fully expected the thin patties to be rubbery, but they were not. The Seasoning: It was uneven. Some bites were devoid of flavor, and some had way too much salt. The Sear: The was no sear. The thin patties cooked way too fast to develop a sear or any color whatsoever. The Preparation: They griddled the burger patties on a hot flat-top to a juicy Well-Done. The burger meat was not over-manipulated. I would guess that the uniform patties came in frozen from a supplier, but that would only be a guess. The cheeseburgers were so uninteresting that we really didn't bother to find out much about them. Besides, my Korean is lousy, so trying to determine the origin of the ingredients seemed like a waste of time. The Cheese: They put a slice of American cheese under the patty. I don't care for this method of preparation--I would have preferred that the cheese be draped over the burger patty, but it didn't matter. The cheese was too mild to contribute any substantial flavors. 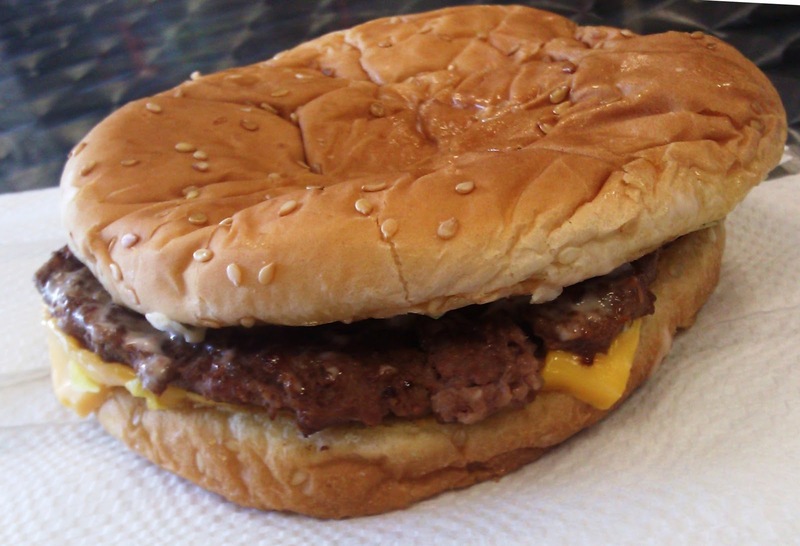 The Bun: The bun as a big, floppy, generic, seeded, and barely toasted burger bun. It was neutral, a little dry, and adequate. The Meat To Bun Ratio: The bun was too large for a single cheeseburger. The Fries: WEAK. 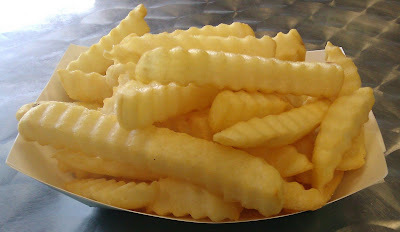 The fries were food service, generic, crinkle cuts, which were not cooked long enough. They were not crisp or tasty. The Value: The value was good--slightly below average burgers for a slightly below average price. The cheeseburger at Olympic Burger tasted like a burger one would get at a hole in wall, which was tucked away in a strip mall at the corner of Vermont and Olympic in K-town. Oh, the chicken nuggets were horrific...rubbery and fishy. Burger Review : This was not something that we would try again--it wasn't awful, it just wasn't good. Rating...2 Bites The fries took this one down a little. 2.5 bites without the lousy fries.